The New York Times, Marco Rubio’s Career Bedeviled by Financial Struggles, Steve Eder and Michael Barbaro, June 9, 2015. NationalJournal, Secret-Money Group Tied to Marco Rubio Super PAC Has Been Researching Presidential Primary Voters, Scott Bland, April 10, 2015. PRwatch, Marco Rubio, Geo Group, and a Legacy of Corruption, Beau Hodai, August 29, 2012. Marco Antonio Rubio (born May 28, 1971) is the junior United States Senator from Florida, serving in his first term, and a Republican candidate for U.S. President in the 2016 election cycle. Prior to becoming a U.S. 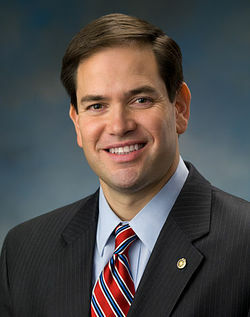 Senator in January 2011, Rubio served as Speaker of the Florida House of Representatives (2007–2009). Rubio was a member of the American Legislative Exchange Council during his time as a state legislator. He has attended multiple donor summits of the Koch brothers' network. On April 13, 2015, Rubio announced that he is running for President of the United States in 2016. "A New American Century" is the official title of his campaign. His announcement video can be viewed here. In late June 2015, Rubio purchased more than $7 million of TV ads in early primary voting states in Iowa, New Hampshire, South Carolina, and Nevada. At least $5 million of that amount has been reserved for Iowa between late November and February, when the Iowa Caucuses begin. Also in late June, 2015, Rubio made ad buys in Alaska and Wyoming, two states with few delegates that have traditionally factored little in presidential campaigns. Pundits believe this strategy was due to the strong possibility that the Republican nomination process will be long and drawn out. Less than one week after Rubio's presidential candidacy announcement, Reuters published a story that he had already received funding commitments in excess of $40 million, a figure many see as the necessary amount to fund a full-length primary campaign. On April 9, 2015, the Conservative Solutions Super PAC was launched to support Rubio's bid for the 2016 Presidency. The PAC is led by Warren Tompkins, "a longtime Republican operative." The Washington Post reports that, "Tompkins will be joined by media consultant Jon Lerner, a longtime political ad maker; communications director Jeff Sadosky, a veteran of Sen. John McCain's 2008 presidential campaign and until recently a spokesman for Sen. Rob Portman (R-Ohio); and top fundraiser Jon Graham, of the firm Gula Graham." The website for the PAC can be viewed here. During his 2010 campaign for the US Senate, an St. Petersburg Times and Miami Herald investigation revealed that Rubio had misused a Republican Party credit card. Records showed that Rubio had "charged grocery bills, repairs to the family minivan and purchases from a wine store less than a mile from his West Miami home to the Republican Party of Florida while he was speaker of the Florida House." Rubio defended his actions by stating that he reimbursed the party for all expenses and said GOP staffers, who also had access to the card, could have been responsible for some of the charges. However, IRS rules and party spokeswoman Katie Gordon explicitly state that party credit cards are not to be used for any personal expenses. Furthermore, Rubio failed to pay back the Republican Party on a consistant basis, sometimes going as long as six months before reimbursing the party. In 2012, during an interview with Fox News Anchor Bret Baier, Rubio apologized, stating "I did not bill personal expenses to the Republican Party of Florida. The Republican Party of Florida never paid my personal expenses. Never. But look, you know, I shouldn't have done it that way. It was a lesson learned...It was a mistake. If I had to do it over again, I'd do it very differently." Rubio has attended at least two Koch network donor summits as an invited speaker. In January of 2015, the Kochs held a meeting in Palm Springs, California where he was invited to speak alongside other Presidential hopefuls Sens. Ted Cruz of Texas, Rand Paul of Kentucky, and Gov. Scott Walker of Wisconsin according to Politico. Rubio also delivered a speech at the Koch meeting at the St. Regis Monarch Beach Resort in Dana Point, near San Diego, California in June, 2014. Rubio is an alumnus of ALEC and as of October 2015 is one of 13 US Senators participation in their Federal Relations program, according to ALEC's website. The purpose of the Federal Relations program is to bring "state legislative leaders into contact with their congressional counterparts" and enable "ALEC members, both state and federal, to secure and protect a sound and balanced government. As a Florida State Legislator in 2005, Rubio voted in favor of the "Stand Your Ground" law that later became infamous after the shooting of unarmed Florida teenager Trayvon Martin. The bill was pushed through the Florida legislature by the National Rifle Association (NRA), which weeks later brought the bill to ALEC, where it was adopted as the "Castle Doctrine Act." After the law was invoked to protect George Zimmerman from arrest after killing Martin, many of the law's supporters were criticized. The two primary sponsors of the Florida Stand Your Ground legislation, ALEC members Representative Dennis Baxley and state Senator Durell Peadon, agreed that the law should be reviewed after the controversy. However, Rubio disagreed and maintained his support for Stand Your Ground legislation, stating "I voted for it and I think there is rational behind it but we have no idea whether that applies at all in this case. I think that's very important to understand." While working as a Florida State Representative from 2000 to 2009, Rubio developed close ties with the Geo Group, a leading private prison operator with annual revenues of more than $1 billion, nearly all of which is earned through contracts with local, state, and federal governments. An analysis conducted by CMD found that from 2005 through 2010, Geo dispensed through its PACs $15,000 to the National Republican Congressional Committee, $32,000 to the National Republican Senatorial Committee, and an additional $10,000 over 2009 and 2010 directly to the Marco Rubio for U.S. Senate PAC. In addition, GEO CEO and founder George Zoley gave $7,400 in personal contributions to Rubio's campaign. Throughout his career, Rubio has received close to $40,000 in contributions from the GEO Group, making him the top recipient among current sitting U.S. Senators. McCaig's letter suggested that budgetary provisions which called for $110 million to be appropriated as a giveaway to GEO Group were inserted into the state budget under questionable circumstances (particularly the cycle of influence between GEO's parent company, Wackenhut Corrections, Geo, and the Florida Senate). Federal investigators began looking into the matter. According to DBA Press, Rubio and other state GOP lawmakers and party contributors were the subject of "multiple wide-ranging state and federal investigations conducted by the FBI and the Florida Department of Law Enforcement," including $110 million in appropriations for the GEO-designed and -operated Blackwater River Correctional Facility, which opened in November 2010. Rubio was Speaker of the Florida House of Representatives at the time that the state government contract for $110 million was awarded to the GEO Group, soon after he had "hired an economic consultant who had been a trustee for a GEO real estate trust." In 2009 and 2010, the GEO Group Inc. PAC contributed $10,000 to the Marco Rubio for U.S. Senate PAC. In addition, on one single day in 2010, "several top GEO corporate executives, along with GEO lobbyists and subcontractors, gave a total of $33,500 in individual contributions to the Florida Victory Committee, a PAC created for the benefit of three other PACs: Marco Rubio for U.S. Senate, the National Republican Senatorial Committee and the Republican Party of Florida." GEO Chief Executive Officer and founder George Zoley made a total of $7,400 in personal disbursements to the Rubio campaign that day. McCaig's letter "sparked the interest of federal investigators," according to DBA Press. Florida's prosecution ended up focusing on the alleged "improper use of Florida Republican Party credit cards . . . [by] former party chairman Jim Greer." The appropriations language for Blackwater CF was written into the 2008-2009 budget by Rubio's former budget chief, Representative Ray Sansom (R-Destin). He "was indicted on charges of lying to a grand jury, official misconduct, grand theft and conspiracy in relation to the Odom case," but Florida dropped all charges in May 2011. The federal immigration reform bill of 2013 shone a new spotlight on Rubio's connections to GEO Group. As the Columbia Journalism Review pointed out in June 2013, GEO Group "operates many of the federal facilities that hold detained or incarcerated immigrants," and Rubio was not only a "crucial broker" on the bill, but was also "the Senate’s leading career recipient of contributions from the Florida-based company, garnering $27,300 in support, according to data compiled by the Center for Responsive Politics." GEO Group had pledged not to participate in the debate around immigration reform, but in 2013 the company hired a lobbying firm founded by Cesar Conda, then Rubio's chief of staff, to lobby on "issues related to comprehensive immigration reform," according to The Nation. ↑ Ashley Parker and Alan Rappeport, Marco Rubio Announces 2016 Presidential Bid, New York Times, April 13, 2015. ↑ Marco Rubio, MarcoRubio.com, marcorubio.com, 2015. ↑ Sahil Kapur, Marco Rubio Plans TV Ads Worth $7 Million in Early-Voting States, "Bloomberg Politics", July 2, 2015. ↑ 5.0 5.1 5.2 5.3 Michelle Conlin, Marco Rubio: the 2016 presidential campaign's $40 million man, "Reuters", April 18, 2015. ↑ Tarini Parti, Oracle's Larry Ellison to host fundraiser for Rubio, "Politico", May 13, 2015. ↑ 7.0 7.1 7.2 Ed O'Keefe, Marco Rubio gets a super PAC, The Washington Post, April 9, 2015. ↑ 8.00 8.01 8.02 8.03 8.04 8.05 8.06 8.07 8.08 8.09 8.10 8.11 8.12 Katie Glueck, The power players behind Marco Rubio's campaign, Politico, April 13, 2015. ↑ Steve Eder and Michael Barbaro, Marco Rubio’s Career Bedeviled by Financial Struggles, "The New York Times", June 9, 2015. ↑ Steve Bennen, Rubio’s controversial finances draw new scrutiny, "MSNBC", June 30, 2015. ↑ Charlie Spiering, Marco Rubio Campaign Slams New York Times for Questioning Personal Finances, "Breitbart", June 9, 2015. ↑ 12.0 12.1 12.2 12.3 Tom Hamburger and Sean Sullivan, How Marco Rubio turned political star power into a soaring personal income, "The Washington Post", June 29, 2015. ↑ 13.0 13.1 13.2 Beth Reinhard and Scott Hiaasen, Records show Marco Rubio spent thousands with GOP credit card, "Tampa Bay Times", February 24, 2010. ↑ Arlette Saenz, Rubio Admits 'Mistake' in Use of State Party Credit Card, Takes on Other Controversies, "ABC News", May 1, 2012. ↑ American Legislative Exchange Council, ALEC Senate Members. American Legislative Exchange Council, accessed June 2015. ↑ GEO Group, Welcome to The GEO Group, Inc., Company website, Accessed August 21, 2014. ↑ 22.0 22.1 22.2 22.3 22.4 Beau Hodai, "Marco Rubio, GEO Group, and a Legacy of Corruption", PRWatch, August 29, 2012. ↑ Influence Explorer, GEO Group Profile, Influence Explorer, 2015. ↑ 24.0 24.1 24.2 Beau Hodai, Marco Rubio, GEO Group, and a Legacy of Corruption, originally published by DBA Press, January 2011; cross-posted to and updated at PRWatch, August 29, 2012. ↑ Michael Cohen, How for-profit prisons have become the biggest lobby no one is talking about, Washington Post, April 28, 2015. This page was last edited on 11 October 2017, at 20:24.